I think it’s safe to say that an everything bagel would be included in my last meal. Unwilling to eat the equivalent of five slices of bread (or whatever people say a bagel amounts to) all that often, I’ve taken to flavoring other, healthier things with everything seasoning. I’ve done the infamous Everything English Muffin. I’ve used everything-flavored crackers to crust salmon. I’ve sprinkled everything seasoning mix on cottage cheese, salads and eggs. 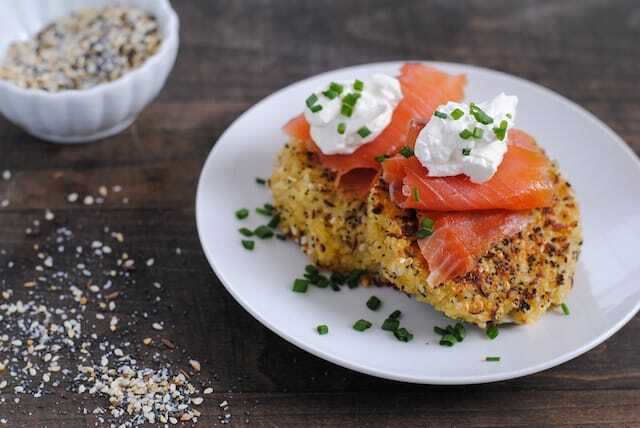 These cute little quinoa cakes are sprinkled with everything bagel seasoning and then cooked until they are nice and golden brown on the outside. 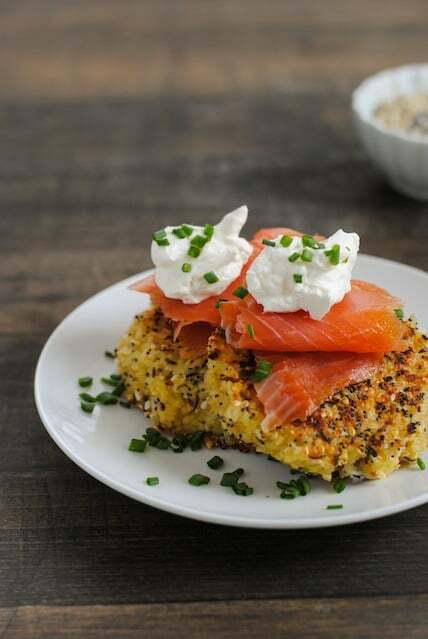 Topped with smoked salmon and crème fraîche, this dish is perfect for breakfast, brunch, lunch or even a light dinner! 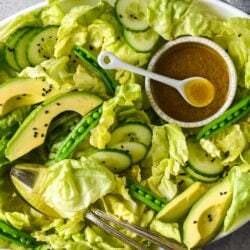 Make the Everything Seasoning: In small bowl, stir together all ingredients. Store at room temperature in an airtight container until ready to use. You will have a little bit left over to sprinkle on other things. Make the Quinoa Cakes: In medium bowl, lightly beat eggs. Add quinoa, breadcrumbs and cheese; stir until well combined. Form mixture into 4 (1/2-inch-thick) cakes. Sprinkle both sides of cakes with Everything Seasoning, lightly pat to adhere. Heat large nonstick skillet over medium-high heat. Spray skillet with cooking spray; transfer cakes to skillet. Cook 4 to 6 minutes per side or until cakes are golden brown. 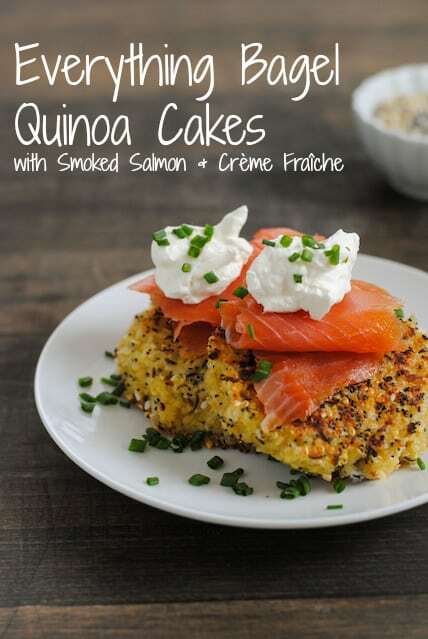 Serve quinoa cakes topped with smoked salmon, crème fraîche and chives. LOVE this! Everything bagels with smoked salmon were my favorite growing up in NYC. 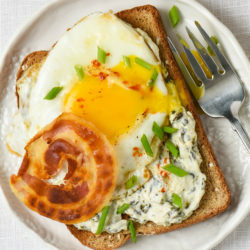 Love this healthier option to bagels (one of my guilty pleasures!)! 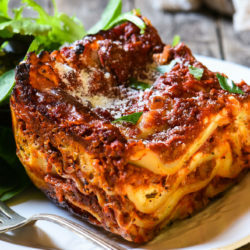 Looks delish, Lori!! !